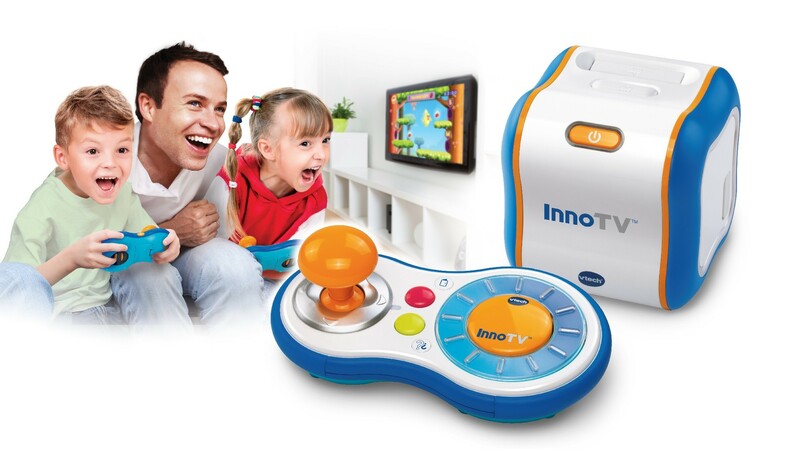 Chicago – Today VTech announces the availability of InnoTV™, an educational TV-connected gaming system designed with preschoolers in mind. VTech pioneered the standard for innovation in educational gaming a decade ago with the highly successful V.Smile® V.Motion® TV Learning Systems selling over 11 million worldwide. The company is continuing to revolutionize the way kids learn through play with the introduction of the cutting-edge InnoTV, the perfect first TV-based gaming system for kids. 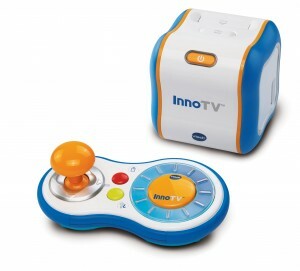 InnoTV features an easy-to-use wireless controller and a large number of learning games just for preschoolers that introduce language arts, math, science, STEM learning concepts and more, with access to a huge educator-supported library of additional games on VTech's Learning Lodge® app store, as well as compatibility with a variety of InnoTab® MAX cartridges*. 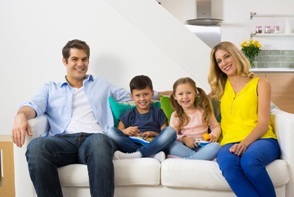 "The family gaming console has found a welcome place in many family rooms for good reason," said Dr. Eric Klopfer, VTech Expert Panel member and Platform Learning Expert. "The console connected to the TV provides an interactive focal point for family gaming. Even when children are playing games targeted solely at them, the rest of the family has the opportunity to observe, question, suggest, and laugh with the child behind the controls. InnoTV brings that experience to younger children, with age appropriate and educational content. It also notably does so by providing ways of accessing existing content from other VTech products to make that initial jump even easier." InnoTV comes with exciting, single-player, age-appropriate educational games, and also allows for multiple players, providing opportunities for social co-playing, important for preschoolers learning to share, cooperate and take turns. InnoTV includes both competitive and cooperative multiplayer games that are fun for the whole family (one remote can be shared, or use an additional controller, sold separately). Parents can play along from their smartphone or tablet, where they can also personalize their child's profile and customize the learning content in select games. The kid-friendly controller is specifically designed for small hands, with special styling that makes it easy to use by both right- and left-handed kids. It offers a simple design for preschoolers developing fine motor skills, making it easier for them to manipulate than game controllers traditionally found on adult gaming consoles. 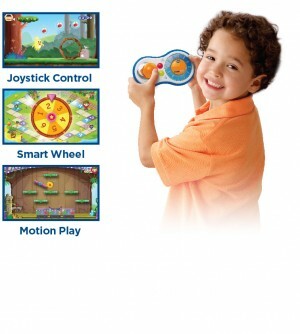 The controller features a joystick, smart wheel and motion control so children can tilt and shake it to play select games. The smart wheel allows for even more engaging play experiences built into the games, such as the thrill of spinning a number wheel in the multiplayer board game to find out how many spaces you can move. InnoTV features built-in Wi-Fi for streaming and downloading additional games and extensive educational content from the Learning Lodge, with more than 100 titles rolling out by the end of the year. Additionally, it is compatible with select InnoTab library cartridges, further extending the play value. The curriculum of each of the games lets kids progress at their own speed and level up with developmentally appropriate content. Many of the games align with Common Core curriculum standards, such as the Island Challenge game found in the Play and Learn Starter Pack bundle, allowing children to practice recognizing and spelling sight words, a popular curriculum. And because kids learn best when they're having fun, many new software titles feature popular characters preschoolers love, including Frozen, Paw Patrol, Miles from Tomorrowland, Sofia the First and Doc McStuffins. "VTech has a rich history of award-winning educational products, including our original break-through TV learning system launched more than 10 years ago," said William To, President, VTech Electronics North America. "InnoTV combines the educational gaming format parents loved in V.Smile and radically updates it with the jumps in technology we've seen in the last decade, so there are no wires for preschoolers to get tangled and it’s easy to download additional educator-supported learning content through the built-in Wi-Fi. We truly believe this is the best first gaming system for kids." Additionally, 33 music albums and 23 videos are available for purchase. InnoTV is available now at major retailers nationwide and Amazon.com. It is for children ages 3 – 8 years and retails for US$69.99, making it an affordable first gaming system for kids. For more information, visit www.vtechkids.com/InnoTV. VTech is a world leader in age-appropriate and developmental stage-based electronic learning products for children. As a pioneer in the learning toy category, VTech develops high-quality, innovative educational products that enrich children's development and make learning fun. With a rich, almost 35 year history, VTech has not only established itself as a learning authority but also consistently remains at the forefront of innovation with multiple award-winning products such as the InnoTab® MAX, VTech's first children's tablet with Android™ learning content, Kidizoom® Smartwatch, the first smartwatch for kids with a built-in camera, InnoTab® 3S, MobiGo®, V.Reader® and V.Smile®. The Learning Lodge®, VTech's comprehensive app store, features a robust library of more than 800 educational and entertaining games, e-Books, music and videos with engaging age-appropriate content across the widest variety of curricula, with content expanding to offer even more titles. The company also has a broad range of award-winning infant and preschool products available in 25 different languages worldwide, with more than 100 new products introduced every year. VTech was awarded a prestigious 2015 Toy of The Year (TOTY) Award for its Go! Go! Smart Animals® Zoo Explorers Playset™. In order to further strengthen VTech's position as a learning authority, the company's Expert Panel, with esteemed experts in reading, language arts, science, math, and child development, consult on new product introductions and Learning Lodge content.